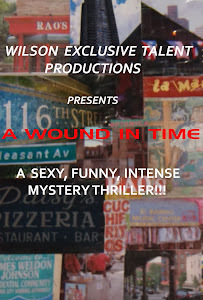 A WOUND IN TIME: CONGRATS RON AND CLARENCE! Congrats to two members of the Off Broadway cast of my supernatural mystery thriller, "A Wound In Time", Ron Rivera and Clarence Leonard Jr., in the upcoming film "Pocket Full Of Nickles". Ron is Producer and Clarence plays the role of "Mr. Burns" in the film. Clarence was cast in the role after the film's Director saw him in my Off Broadway production. Check out the official trailer!